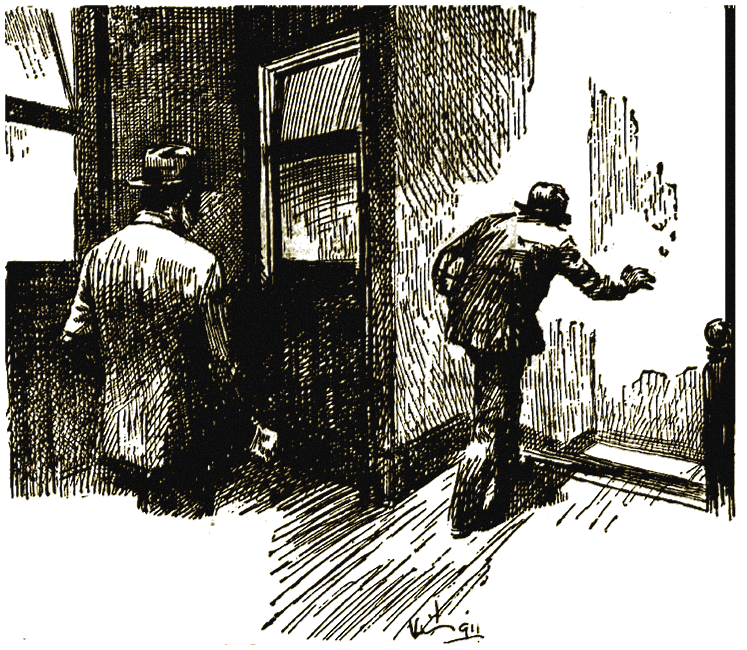 CONDON MURDER FOR "SMITH'S WEEKLY"
The killer flees from the scene of the crime. DESPITE the most searching interrogations of hundreds ot the murdered money-lender's clients, and the most painstaking following up of every clue known to them, the Sydney police are still at a loss to lay their hands on the murderer. The crime was committed in an upstairs room at 17A Pitt Street, Sydney, on August 11, 1927 between the hours of 1 and 2. Harry Edwards, one of Condon's clients, was waiting outside the room when a man hurried out, closed the door, and ran down the stairs. Suspicious that something was amiss, Edwards called a policeman. Together they peered into the room through a fanlight and saw Condon huddled in a corner on the floor. When the door was opened, it was discovered that Condon had been battered to death with a shingling tomahawk, though the murderer had taken away the weapon with him. At first it appeared no money had been stolen, but later £60 was found to be missing. Girls in a neighbouring workroom had heard sounds of a scuffle, but nothing to suggest that an awful crime was being perpetrated within a few feet of them. Such in outline is the latest of Sydney's unsolved murder mysteries. "Smith's" has commissioned Aidan de Brune to propound a theory consonant with possibility. Mr. de Brune is well qualified for the task. He has been for years a student of crime, both as a working journalist and as an author, with a reputation now extending far beyond the Commonwealth. By a strange coincidence, his mystery story "The Dagger and the Cord" commenced serial publication in the Sydney Guardian a few days before the slaying of Condon. And de Brune laid the scene of the murder which forms the central theme of his story within a stone's throw of the room in which the moneylender was done to death! The brilliant imaginative reconstruction of the Condon crime is, of course, fiction. The novelist has selected names at random, and these and his story are entirely fictitious. For instance—take the surroundings and Condon's customs of business. They entirely preclude any theory of premeditation. The crime, says de Brune, cannot be other than of sudden passion. Thus the introduction of the murder weapon must be simple. Is there a simpler way, or one more likely to throw Condon off his guard, than the tomahawk being introduced into the office as an ordinary parcel? Take the second police theory—that the murderer got his victim into position by paying off a P.N. [*] Here are two faults. First, if the murderer had the money to settle his indebtedness, then why the murder after the money passed? Again, receipts are not given for discharged P.N.'s. The cancelled note is its own receipt. "And right through," de Brune argues, "they're looking for things extraordinary, and neglecting the simple things." "'LO, TOM! How's the cottage going?" "Fine!" The tall, young fellow standing on the steps of the big block of offices turned with a cheerful grin towards his friend. "Going to start shingling, Saturday. You'd better run down and give a hand. Teach you. something." "Can't. Booked up!" The answer came muffled from the interior hall. Yet a good fellow! All the boys at the office swore by David Condon. Many a man he had helped out of a difficult hole by the loan of a few pounds—and if he did charge stiffly for the accommodation, well, they were only petty clerks in public offices with only a few quid in each pay envelope, and no proper security. Tom realised that he must owe David Condon quite a few pounds by this time. It had commenced soon after he took up that sixty-feet frontage block at ____. He had intended to fence it and let it lie idle until he had completed the payments on it. One day, in the future, he would build—a home for the one girl, and himself. Someone had told him of David Condon, and what a good sort he was. Tom had jibbed, at first. He did not like the term "money-lender." He had heard that dealings with those men always ended disastrously. His friend had laughed, boisterously, and hauled him down to Sutton Chambers, at the end of Pitt Street, where in a bare upper chamber sat David Condon. He had not looked like a money-lender—he had not talked like one. But the money-lender was practical He demanded facts. How much had the land cost? How much had Tom paid off it? What sort of a house did Tom intend to build? What...? The questions awoke Tom's dormant ambitions. Almost to his surprise he found his plans springing to life, complete in detail. Condon sat and nodded gravely. When Tom finished he reduced the problem to pounds, shillings, and pence. The land would cost so much; timber, cement, and other building materials, so much. Tom, his own builder during his week-ends, would prove a big saving factor on the costs. Condon offered to finance the building of the house. He would purchase the material as Tom required it, and have it sent down to the land. Tom, on his part, engaged to give all his spare time to the work—and sign P.N. 's for the purchases. Later, when the house was built, or all the material purchased, they would work out terms of repayment. Even then, the old money-lender was able to show estimated figures to prove that the repayments for the building loans would be well under the rental value of such a house. It was a marvellous offer and Tom's hand shook as he signed the agreement and made out his first requisition for building material. It was still more wonderful when he and Mary found the cement and timber on the ground—and he plotted and built the first cement piles for their own home. Week by week the work had steadily progressed. The walls were up, and the cement-asbestos outer sheetings in place. The roof was complete—only lacking the shingles he and Mary had decided to use in the place of the usual sheet iron. When they went out that Saturday they would find the shingles stacked ready to hand. There would be over two squares. Could he place them all that week-end? It was to sign the P.N. 's for the shingles that David Condon had sent for him. Yes, he would go down to the old man, and on the way he would purchase the shingling tomahawk. He would just have time—and to get back by half-past one. The seed merchant occupying most of the entrance hall of Sutton Chambers was doing a good business as Tom pushed through the small crowd and ran up the stairs to David Condon's offices. The money-lender's door was ajar, and Tom listened before knocking. He could hear the murmur of voices in the room. Condon's door was rarely shut during his hours of business. His clients knocked and, unless bidden to enter, waited. Tom waited, fuming Impatiently up and down the narrow passage. At length a man came out of the office and ran down the stairs. Tom entered the office, pushing the door shut. "Hullo, Tom!" The money-lender looked up from some notes he was making. "What have you got there?" For the moment the clerk looked at the paper-wrapped parcel he was carrying, almost in surprise. Then he laughed. "A shingling tomahawk, David. Ever seen one? Three tools, and more, in one, y'know. Mighty convenient when one's scrambling on the slopes of a roof." He placed the tool on the desk before where he sat. "What do you want me for, David? I'm due back at the half hour." "Thought we might get this litter of paper in something like order." Condon took, a small pile of P.N. 's from under a broken hammer head. "You've had a lot of stuff, y'know, Tom." "S'pose so. What does it work out to, David? Over a hundred?" "With the asbestos lining and the doors and windows? Yes, a lot more." "Well, it shouldn't." The clerk's chin jutted out, determinedly. "Y'know. We estimated on about a hundred and twenty, and I've kept well within my estimate of material." "You forget you've been working on bills, Tom. Some of 'em ran out and had to be renewed." "But you. agreed to purchase the material, and when we knew the exact cost we were, to work out a system of repayments, according to the contract." "Yes." Condon paused for a moment. "But I didn't agree to pay cash for your purchases. All I agreed to do was to get you the credit. Well, I did. I take up all those bills when you've signed up straight with me." "You sign this bill, covering all the money I've advanced for you on materials, etc. That. will complete the agreement we signed at the first instance, and then everything, will be In order." Tom drew the bill towards, him and glanced at the figures. Two hundred and thirty-nine pounds! Surely he had never purchased that amount of material. He had been careless, ordering what he thought necessary. But—two hundred and thirty-nine pounds! He'd swear there was some mistake! There was not more than a hundred, or a hundred and twenty pounds' worth of material built into the house, or lying about the land! "What's this, Condon?" The man's eye blazed across the table at the money-lender. "I don't owe this!" "It's all there, Tom." The eyes of the money-lender tried to meet those of the angry man. "It looks a lot, but when it's divided into instalments." "Two hundred and thirty-nine pounds, and that at seven per cent, per annum for two years. That's the agreement, Condon, Isn't it? Well, that and the land repayments will mean well over £3 a week—and I'm getting under six! I'll not pay it!" He got up from his chair and strode angrily up and down the room. Condon crouched back in his chair, behind his desk. He was accustomed to outbursts of rage from a few clients of a certain excitable type. Let them rage and storm. In time they became calm again, and—reasonable. "It's robbery! Damned theft!" The clerk halted, facing the money-lender across the desk. "I'll not sign another thing!" "The material's mine, until I release it to you," suggested the moneylender in quiet, even tones. "The land's mine!" There was almost a note of triumph in Tom's voice. "Take your stuff off my ground—and be damned to you!" "You forget, Tom." The money-lender selected a document from the small pile under his hand and spread it open on the desk. "There's your transfer of your interest in the land to secure my rights to the building erected on the land. Now, Tom, be sensible and sign. I'm not a hard man and if you can show me the repayments are―"
His eyes dropped and he fell silent under the hot anger glowering from the face of the clerk. Tom was striving to still the merciless drumming in his head—to face facts, and choose the best course. He had lost his land and his house! Through his carelessness he had allowed himself to be involved in such a mass of debts and agreements that he might never be able to free himself. He could sign this bill and complete the building of his house. Mary and he could complete their long discussed plans. They could marry and go and live In that house. But it would not be their home—it would be Condon's house and more than half of each pay-envelope would have to go to him. A gust of anger swept the clerk. His hot fingers clenched inwards on the articles on the table. He wanted to take that face, smiling at him across the table, and tear it apart, feature from feature. "There's nothing to get angry about, Tom!" The smooth voice seemed to come from a long distance off. "You're―"
Nothing to be angry about! Only his life and Mary's trampled on, and destroyed their plans for a dream home—just one little corner of Paradise on earth to belong to them alone―defaced and despoiled. Again his muscles tensed; again he felt the hard substance clutched against his right palm. He looked down. It was the shingling-tomahawk, swathed in its wrappings of shiny brown paper—yet the handle nestled against his palm as if he had used the tool for months. "You're going to be sensible, Tom?" The old man was almost pleading. "You got engrossed in your work, and didn't think. Perhaps I should have warned you. ..."
He hadn't thought—but he was thinking now! Even if he signed this bill he might lose his land and house. He might lose Mary! He could not expect the girl to wait for ever—or until he had broken through the web of debt in which this man had involved him. He might even take the land and the house. Could he also saddle him with this enormous debt? Tom began to feel that he could—and would. In sudden anger he turned to face the money lender. A look of deep fear came on the man's face, and he flung up his left hand, as if to ward off a blow. Tom's right hand had shot forward against that hated face. He felt the jerk of the impact of the blow—and then he hit out again, in a mad frenzy of fear and hatred. Condon was queerly huddled in the corner of his chair. His left temple was exposed and over the greyness of the close-cropped hair were two ghastly, gaping, red wounds, through which the thick blood welled incessantly. Tom looked down at his right hand. He still held the shingling tomahawk, but now the blade-edge gleamed ruddily through the torn paper. A groan from the wounded man and Tom sprang forward, sweeping the light desk aside. Condon strove to lift himself on his chair and cry out, but again the keen-edged blade fell, driving him down into oblivion. He must not call out! Tom flung a quick glance towards the door. It was fastened; no one could get in. He turned again to the money-lender. He had fallen from the chair to the floor and lay, the limbs squirming and scuffling over the bare boards. Tom bent over his victim. He was quite cool and collected. He realised what he had done, and felt no remorse. Dully he realised that would come later. For the present he must use every nerve in the fight for his own life—to get away unseen and unknown from that awful room. The dying man rolled over and strove to sit up. Tom looked wildly around him. He must stop him groaning. That would rouse the inmates of the house. There were girls working in a room along the passage. They would become inquisitive, and perhaps start to investigate. A towel over a chair-back caught his eyes. In a. moment he had it twisted over the dying man's head, stifling his low cries and moans. He seemed to be kneeling there for hours, holding the twisted towel over the man's lips. Would he never die? The room seemed filled with an uproar of sound, over which rose the stertorous breathing of the dying man. Would he never die! Again a gust of frenzied fear and rage swept over the man. He believed he could hear voices whispering outside the door—voices accusing him of the murder of the old money-lender—voices naming him a new Cain, accursed! He looked around him, hopelessly. Almost under his hand lay the shingling tomahawk. He changed the towel-ends to his left hand and picked up the blood-stained weapon. He closed his eyes as he drove down the last blows that separated life from the tortured flesh. He was free—from That. A moment's hesitation and he rose from beside his victim. He felt no compunction—no remorse. All he knew was that he must get away—silently, and without being seen. Someone knocked at the door—a series of staccato blows on the frosted glass panel of the door! For the moment the man's heart ceased to beat. Who was there? Why had they knocked? Then he laughed, silently. It was the custom to knock on Condon's door. If he were disengaged and the door closed, he would open it. If not, the caller waited. Well, Condon was engaged! Tom's face broke into a mirthless grin as he stood facing the door. But, when he went out the man who had knocked would enter—to that! First, he must leave no clue in the room that would lead to him.. There was that little pile of P.N.'s. Sorting them carefully. Tom thrust them into his pocket. Then he turned to the agreement and the bill. These too, he stuffed into a pocket. For a full minute he stood in the centre of the room, looking around him. Had he left anything to identify him with the crime? The tomahawk, still in its blood-stained paper wrappings, depended from his belt at his back, concealed by the looseness of his open jacket. There was only one thing more. He caught up the receipt book from the desk and slipped it in his pocket. The police must hunt to find who had visited Condon that day. He crouched against the door, listening for noises in the passage. He could no longer hear the half-giggling whisperings of the girls. No doubt they, had gone back to their work—but the man who had knocked at the door remained. He could hear his impatient pacings on the bare boards. A moment's hesitation and Tom flung open the door and walked out into the corridor. The waiting man immediately advanced towards the door. Tom pulled It shut behind him. "Condon in?" asked the man. "He's there. Engaged for the moment, though." Tom had his handkerchief to his face, and spoke through the folds. He passed the man and ran down the stairs to the street. As he pushed through the seed-merchant's customers he looked at his watch. A quarter to two! Had but a bare 30 minutes elapsed since he had entered those doors? He had lived a lifetime in those scant, swift minutes. For some, time he walked swiftly up Pitt Street, hardly caring or knowing where he went. Then he remembered his office. He was due back there at one-thirty, and now the clocks were chiming the hour of two. Obedient to the custom of years, he turned back to the huge block of buildings where he spent most of his waking hours. Something irked his forehead. He took oft his hat and rubbed it with his handkerchief. Something seemed to be clinging there—something he could not shift. Puzzled, he walked on a few steps until he came to a shop displaying long mirrors. There was nothing on his forehead; yet, he could still feel it there... He must get away by himself, and think. It was a brand on his forehead—the brand burned in the flesh of him who slew brother man. But why on him? He had not intended to kill Condon! If the man had not looked at him with that queer questioning look in his eyes; if he had not thrown his arm up in that involuntary guard against some imaginary blow—if his own hand had not been gripping the handle of that shingling tomahawk. 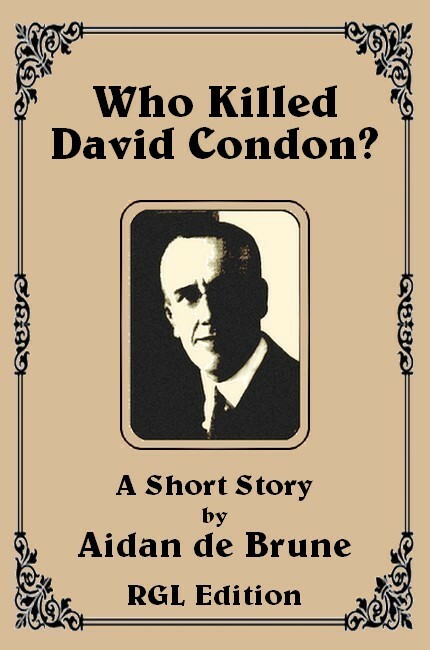 Condon was dead, and he was his murderer. Yet he had had no thought of murder at any time. Some power without himself had driven him to destruction. Condon was dead! The man with whom his home and happiness had been involved was dead, and would be proclaimed the victim of a brutal murder. He, the murderer, must go forth, ever a hunted fugitive. He raised his arms to the sunlit blue of the skies over the city streets—and groaned.